Are you having a hard time deciding what to make for dinner? Trying to clean out the fridge? Or figure out what to do with that lone, leftover parsnip? Allrecipe’s Dinner Spinner will come to the rescue. This useful, free recipe app is a quick and easy inspiration to help you fix something for the dinner table. 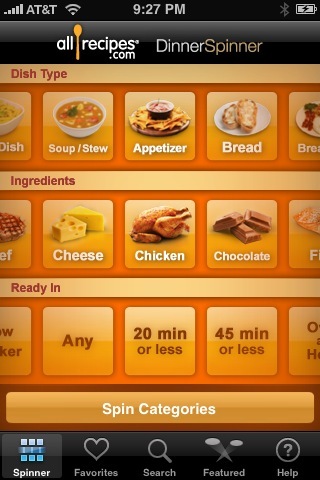 The app gives you access to the top-rated recipes from the famous Allrecipes.com website right in the palm of your hand. Users select the spinner tab and lock in the dish type, ingredients, and ready in (the time they want to invest) and hit the button “spin categories”. The dish type includes: appetizers, bread, breakfast, cookies, dessert, beverage, main dish, salad, side dish, and soup/stew. You’ll also be able to select an ingredient from the following choices: beef, cheese, chicken, chocolate, fish, fruit, grain, lamb, legume, pasta, pork, shellfish, and vegetable. And the “ready in” option has everything from 20 minutes or less to all-day slow cooker. And just for fun, users can shake their iPod Touch or iPhone and random categories will be selected. After you’ve hit the “spin categories” button, several matches will be shown. Scroll through the results by moving your finger side-to-side to see all the matches. Click on one of the recipes and you’ll also see ratings, a photo, nutritional information, and reviews. Read the reviews for helpful tips and time-saving hints submitted by members like yourself. Do you like a recipe and want to save it? Simply use the <3+ button to save the recipe for the future. You can also open an e-mail, include a link to that recipe, and share with all your friends. The Dinner Spinner is a fast, fun, easy way to plan dinner whether you’re planning in advance or making a last-minute meal. The app is intuitive and straightforward. Not only is making selections easy, users can also save their favorite recipes, complete searches, or even view the featured recipes. The “ding” sound when the results are ready is also a nice touch. Sadly though, the app offers only a small selection of the recipes available on AllRecipes. There also aren’t too many healthy recipes. The app could use additional vegan and vegetarian recipes and fewer desserts. This lite version is great as it is, but users will need to buy the Pro version if they want more features. The Pro version is offered at the low price of $2.99 and grants you access to all the recipes on the site and the ability to search by specific ingredients, access your online Recipe Box, and open shopping lists. Best of all, there’s no advertising! There ain’t no such thing as a free lunch (usually), but Dinner Spinner will show you for FREE what to make with what you already have in the fridge. That’s priceless. AppSafari review of Dinner Spinner was written by Linda Ta on March 24th, 2010 and categorized under App Store, Food, Search, Utilities. Page viewed 3683 times, 2 so far today. Need help on using these apps? Please read the Help Page.